Florida offensive tackle Jawaan Taylor met with the Bengals on Tuesday, according to Adam Schefter of ESPN.com (Twitter link). Taylor, who stands 6’5″ and 328 pounds, certainly has the size requirements favored by new Cincinnati offensive line coach Jim Turner, but it’s unclear if the ex-Gator will be available when the Bengals make their first-round selection at No. 11. Along with Jonah Williams (Alabama), Andre Dillard (Washington State), and Cody Ford (Oklahoma), Taylor is considered one of the best tackle prospects available in the 2019 draft. If selected by the Bengals, Taylor could immediately take over at right tackle, displacing the recently re-signed Bobby Hart, and would be a long-term option to replace Cordy Glenn on the blindside. Speaking of Ford, the Oklahoma offensive lineman has been extremely busy during the pre-draft season. Per Aaron Wilson the Houston Chronicle, Ford has met with and/or worked out for the Patriots, Eagles, Buccaneers, Vikings, Texans, Cardinals, and Falcons. That’s in addition to his previously-reported stops with the Bengals and Panthers. Ford was a first-team All-Big 12 selection in 2018 and helped Oklahoma win the Joe Moore Award, given to the country’s best offensive line. A left guard in both 2016 and 2017, Ford shifted to right tackle for the 2018 campaign. The Texans are meeting with Mississippi State edge rusher Montez Sweat on Wednesday, reports Ian Rapoport of NFL.com (Twitter link). Sweat is considered of the best defensive ends in the draft (especially after blowing up the combine), so Houston would likely need to trade up from No. 23 overall in order to land him. After starting his collegiate career at Michigan State, Sweat spent two years with the Bulldogs, racking up 22.5 sacks and 30 tackles for loss during that time. Washington cornerback Byron Murphy has met with the Panthers, Chiefs, and Cardinals in addition to his visit with the Steelers, tweets Wilson. In 2018, Murphy earned a spot on the first-team All-Pac-12 list after putting up 37 tackles, four interceptions, and 13 interceptions. Regarded as a first-round pick by most observers, Murphy is the No. 6 overall player on Pro Football Focus’ draft board after allowing only a 47.7% completion percentage against and forcing 17 incompletions. The Rams hosted Mississippi State safety Johnathan Abram on Tuesday, per Tom Pelissero of NFL.com (Twitter link). Abram, who has also met with the Cowboys and Cardinals, is part of a closely-clustered safety class that could start coming off the board at the end of the first round. Daniel Jeremiah of NFL.com, notably, ranks Abram as the No. 1 safety prospect of 2019. Arbam posted two interceptions, three sacks, and nine tackles for loss last year. It’s been a rollercoaster of a ride for Jared Goff these past few years. The first overall pick back in 2016, a lot of people wrote him off as a bust after his disastrous rookie season. But Goff came alive once he was paired with head coach Sean McVay, and has now made the Pro Bowl each of the last two seasons. This past season, the Rams made it all the way to the Super Bowl but Goff had a terrible performance in the big game. There’s been a lot of debate the past couple of years about how much of Goff’s improvement was due to his own natural development versus how much of it was due to McVay’s coaching. This week’s combine re-checks produced very positive news for Oklahoma wide receiver Marquise “Hollywood” Brown, according to Ian Rapoport of NFL.com (on Twitter). Brown, who has been out of a boot for weeks, was given the thumbs up on his surgically-repaired foot. Despite the injury, the 5’9″ receiver is widely projected as a first round pick. Last year, Brown put himself on the NFL radar with 75 catches for 1,318 yards and ten touchdowns. The Rams are meeting with Clemson defensive linemen Dexter Lawrence and Clelin Ferrell on campus, Rapoport tweets. Both players are expected to go in the first round, but the Rams may be out of range at No. 31 overall. Alabama defensive tackle Quinnen Williams will visit the Jaguars on Thursday, a source tells ESPN.com’s Adam Schefter (Twitter link). Houston cornerback Isaiah Johnson will work out for the Falcons on Thursday, Rapoport tweets. The converted wide receiver came away with two interceptions in each of the last two seasons and could go as high as the second round. Staying on the subject of draft-eligible ends, Jaylon Ferguson‘s extensive April tour of NFL cities continues. Among the teams on his reported 22-visit tour: the Bills, Giants, Colts, Eagles, Cowboys, Titans and Rams, per NFL.com’s Tom Pelissero (on Twitter). Ferguson met with the Bills on Monday; he will head southeast for his Giants powwow next. His visits with the Colts and Eagles are on tap for this week, with the Cowboys, Titans and Rams meetings are slated for next week. The Bucs and Bengals were already on the Louisiana Tech-produced pass rusher’s docket. The Rams hosted Florida edge rusher Jachai Polite on Wednesday, tweets Norris. The pre-draft process has not been kind to Polite, who had been viewed as a potential first-round selection. Polite performed poorly during athletic testing, while his interviews with clubs were also widely panned. Additionally, Polite is battling currently battling through hamstring injuries. Los Angeles re-signed pass rusher Dante Fowler Jr. and also added Clay Matthews, but given that a club can never have too many defensive ends/linebackers, Polite could be in consideration. Two teams who will be visiting with Devin White soon are also set to have this draft’s other high-profile Devin on their pre-draft itineraries. The Bengals met with Devin Bush on Monday, Adam Schefter of ESPN.com tweets, adding the Buccaneers are next up on the Michigan-produced linebacker’s schedule. White is expected to go off draft boards a bit sooner, but Bush is viewed as a solid first-round pick as well. Bush finished out the 2018 season with 66 tackles, including 8.5 for a loss, and 4.5 sacks. In 2017, the versatile linebacker posted 95 tackles, 10 for loss, and 5.5 sacks. He is the son of former Falcons, Rams and Browns safety Devin Bush Sr., a 1995 first-round pick who played in back-to-back Super Bowls in the late 1990s. The Bucs hold the No. 5 pick, while the Bengals’ first pick comes at No. 11. Rapp will be receiving a nice tour of the country this month, with a three-time zone trip on the horizon. The Lions, Rams, Giants and Panthers also booked pre-draft summits with the Washington safety, Tony Pauline of DraftAnalyst.com notes. A three-year Huskies contributor, Rapp intercepted seven passes and made at least 50 tackles in each of his college campaigns. Pauline expects Rapp to be a second-round pick. A fellow Washington Huskies product, tackle Kaleb McGary has visits lined up with the Patriots, Rams and Jaguars, per Pauline. The Falcons are also going to work out McGary, who was a three-plus-season starter at right tackle for the Pac-12 program. The Rams are unlikely to re-sign Ndamukong Suh, GM Les Snead says (via ESPN.com’s Lindsey Thiry). Bringing the defensive tackle back is “pretty much guaranteed to be off the table” due to “budgetary constraints,” which means that one of the best remaining free agents will be changing teams in 2019. The Rams have limited cap space to work with after re-signing outside linebacker Dante Fowler and adding safety Eric Weddle, quarterback Blake Bortles, and linebacker Clay Matthews. Last year, the Rams gave Suh a one-year, $14MM deal, and he could command similar money on the open market. The Rams also have future extensions to keep in mind. They want to keep cornerback Marcus Peters in L.A. for the long haul and, eventually, they’ll want to sit down with quarterback Jared Goff to discuss a new contract. While Suh is still an imposing presence, he didn’t look like his old self in 2018. 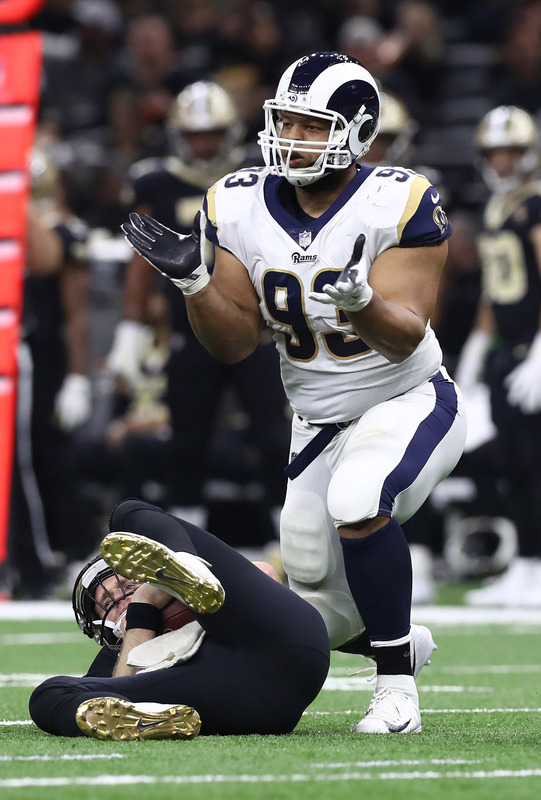 The five-time Pro Bowler finished out with 4.5 sacks from the interior, but the Rams allowed a league-worst 5.1 yards per carry to opposing teams. On the plus side, Suh did seem to get more comfortable with his shift from playing as a 4-3 three-technique tackle to a 3-4 nose tackle as the season progressed. It’s also worth noting that Suh was effective in the club’s first two playoff games against the Cowboys and Saints. And, ultimately, Suh finished out as the No. 20 ranked interior defender in the NFL last year, per Pro Football Focus. That’s not quite as strong as his placement in his prime years – Suh was ranked in PFF’s top 5 as recently as 2017 – but he’s still a productive player at the age of 32.